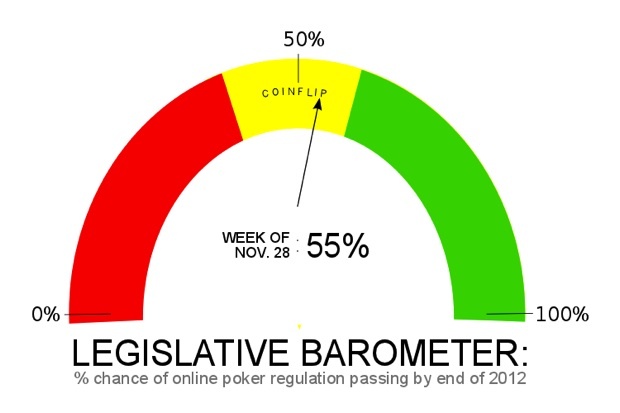 When will online poker be legal in U.S.
We’re rolling out a new feature for Wicked Chops Insider today: the Online Poker Legislative Barometer. The concept is simple: we’re asking connected industry executives, lobbyists, and media members for their take on the likihood that the U.S. passes online poker legislation by the end of 2012–coupling those responses with some tea leaf reading from congressional leaders’ public statements–and spitting out our cumulative reading on the matter. We chose to establish a year-one timeframe for legislation. Why? We’ve consistently maintained that we believe the most likely time online poker regulation is passed will be during the lame-duck Congressional session after the 2012 elections (likely attached to an omnibus bill, similar to the UIGEA). That may be Sen. Harry Reid‘s (D-NV) last chance to get it done (assuming Republicans gain control of the Senate during the mid-terms) and repay the brick & mortars that got him re-elected. With that preamble out of the way, our first reading comes out basically as a coinflip–albeit an encouraging one– at 55%. Not one single individual we polled said online poker regulation passing by the end of 2012 was less than a 60% chance from happening. We received ranges from 60% all the way up to 75%. However, we’ve learned that people in the industry typically have a more optimistic view of online poker’s legal chances than most. No knock on anyone, it’s human nature. Regardless, everyone we spoke with believes we’re better than 50-50, a good sign for sure. The NY Post published a story that many in the industry believe was leaked by someone connected at Caesars Entertainment stating that 1) Caesars is planning an IPO to presumably (in part) raise capital to fund an online poker opeartion, and 2) that internally Caesars execs believe there’s a “50%” chance that online poker legislation passes by the end of 2012. Read more here. Caesars Entertainment CEO Gary Loveman is still very vocally and publicly expressing bullish beliefs on legislation passing. Read more here. On the downside, as this EGR Magazine column accurately notes, senior Republican leadership–as well as established lobby groups like state lotteries–still strongly oppose online poker in the U.S. Read more here. Unconfirmed rumors abound that online poker’s biggest opponent–Sen. Jon Kyl (R. AZ)–may co-sponsor a bill with Sen. Reid. Read more here. However, there are many signs that Kyl isn’t being any more receptive or softening his stance on iPoker. Read more here. Additionally, Kyl has already reportedly “dashed” hopes of a bill coming together in October of this year. Read more here. Indian tribes–who many view as a critical group needed to support any online poker measure–are still divided. Read more here. And those tribes would likely not support any legislation this year. Read more here. However, most lobbyists reportedly agree (with us) that the 2012 lame duck session is the best chance for online poker legislation to pass. Read more here. Finally, with all of the acquisitions and partnerships taking place in the industry, big money is betting that something will happen soon. Read about some of that movement here. So there you have it. There are a lot of positive signs, as well some potential speed-bumps. Take it all in, and you get 55%. Expect another update in two weeks–or if some major news breaks on the regulatory front.